Day one of the An Post Rás rolls out from the same location as twelve months earlier, namely the historic Dublin Castle. This time around the riders will avoid the Phoenix Park, with the 10.2 kilometre neutralised section taking them under the arch at Christ Church Cathedral, past Heuston Station and on to the official drop of the flag outside St Loman’s Hospital, Palmerstown. The route then winds through Leixlip, Maynooth, Kilcock, Summerhill and Trim prior to the first An Post Hot Spot Sprint in Athboy (km 53.9). Riders then meet the first official climb, the category three Lough Crew (km 73.6) and then into Oldcastle for another An Post Hot Spot Sprint (km. 78.8). From there the riders head to Ballyjamesduff and into Granard, to take the day’s third and final An Post Hot Spot Sprint (km. 120.2). This is just over 25 kilometres from the end of the stage and the pace will be intense. 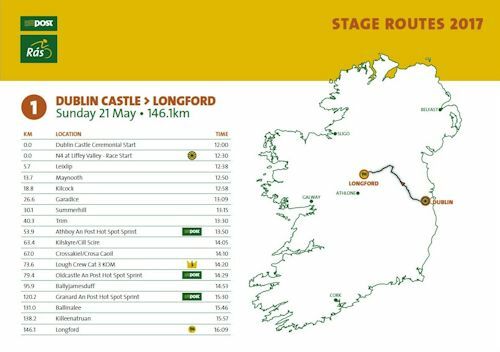 In addition to offering more time bonuses, that gallop will signal the sprint to the finish line in Longford, where the race’s first stage winner and initial yellow jersey will be decided. “On day one we start in Dublin Castle. We did the same last year to commemorate the anniversary of 1916 and there was a good response and teamwork from the event manager in there, Stephen Tobin. He was very pleased with how it went and that made it quite straightforward to start there again. “There is just one climb at Oldcastle on that first day, as well as three Hot Spot Sprints. They are for time bonuses towards the General Classification, although the stage winner will still be the rider who wears the yellow jersey. Stage two has a similar look in some ways, given that it also features three intermediate sprints (An Post Primes). The first is after the riders leave Longford and pass through Lanesborough, Ballyleague and Roscommon. It take place in Ballymoe and will play out after 48.7 kilometres of racing. This is followed just 9.1 kilometres later by the second An Post Prime, located in Williamstown (km. 57.8). From there the peloton will entertain crowds in Cloonfad, Claremorris, Balla, Manulla and Kilnageer before the day’s third and final An Post Prime in Breaghwy (km. 108.5). This is located on the outskirts of Castlebar. 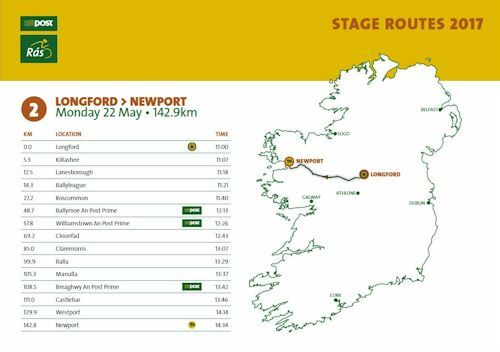 Riders will battle through Westport to the finish in Newport. Another mainly flat and fast day begins at the previous day’s finish line prior to heading through Glenhest, Crossmolina and Ballina en route to the sole An Post prime in Inishcrone (km 59.5). From there the route winds through Rathlee, Easkey, Dromore West, Templeboy, Dromard, Ballisadare, Rathcormac, Drumcliff and Ciffoney. The racing finishes in Bundoran with a final gallop to the line. Donegal rider Ronan McLaughlin put in a massive display five years ago when the race last finished in the town, striking out seventy kilometres from the line in a solo move prior to being passed inside the final 100 metres. The then-An Post rider is now racing as an amateur and may take a slightly more conservative approach this time around, although aiming for the stage win will almost certainly be on his mind. Day four of the race is another in Donegal and will hopefully have similarly sunny weather to 2012. The race has has a mainly flat profile up until this point but that will change dramatically en route to Buncrana, with five categorised climbs lurking along the route. 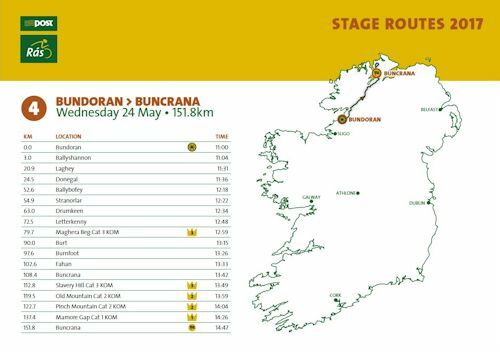 The racing begins in Bundoran and heads through Ballyshannon, Laghey, Donegal town, Ballybofey, Stranorlar and Letterkenny prior to the start of the day’s first climb, the 2.8 kilometre category three Maghera Beg (km. 79.7). After Burt, Burnfoot and Buncrana the second ascent, the category three Slavery Hill (km. 112.8) is immediately followed by the category two Old Mountain (km. 119.5). Straight away riders then face into the similarly-ranked Pinch Mountain (km. 122.7). That trio of close peaks will likely break things up. Any regrouping will be jarred by the final climb, the fearsome Mamore Gap (km. 137.4), with the category one slopes likely to cause even more havoc. From there just 14.4 kilometres remain until the finish, making it likely that the up and down roads will play a major effect on the shape of the race. “The day to Buncrana should be a great one. Mamore Gap is one of the hardest climbs in the country, but it’s also very hard before you even get there. There is a lot of climbing on the way there, and it is pretty hard to come back from it also. There will be a chase all the way back into the finish. The following day is significantly flatter with just two category three ascents lying in wait. However, at 181.2 kilometres this is the longest stage of this year’s An Post Rás and tiring legs may find the distance to be a big consideration. 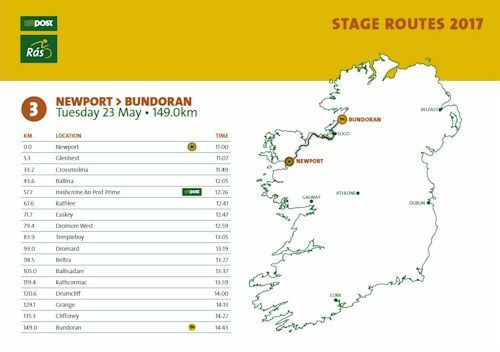 As was the case on stage four, Burnfoot and Burt feature on the route, after which the peloton will tackle a fast descent at Ramelton, pass through Rathmullen. Then begin the category three climbs of Anny Far and Near/Carnagarrow (km. 69.7). Just over five kilometres later the peloton will scrap it out to the top of the category three Ballymastocker (km. 75), racing on to the Donegal Gaeltacht locations of An Bhualtaigh, Tulaigh na Dala, Leat Beg and Carraig Airt. From there the race heads to Portnablagh with An Post Primes in Dunfanagy (km. 124) and Falcarragh (km. 136). Less than 50 kilometres remain on the stage with the route taking the riders through Gweedore, Anagaire and Mullahduff before the finish line in Dungloe. 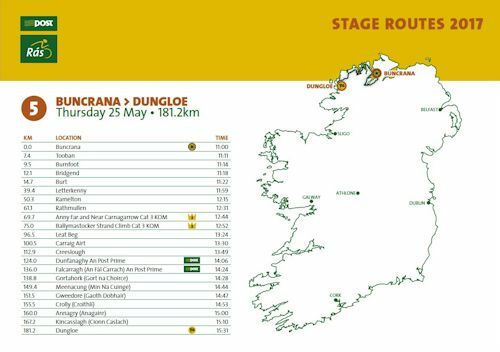 “The day to Dungloe has just two categorised climbs but it is the longest stage. There are a lot of undulating roads along the way. That up and down terrain plus the distance will make it very hard, but also where it comes in the race. 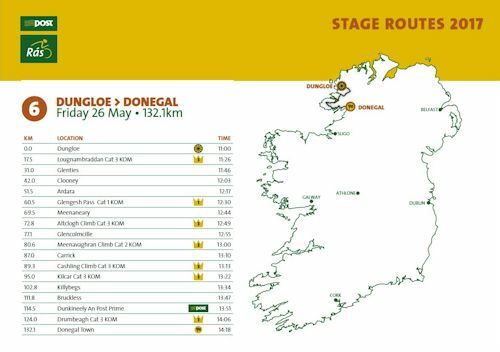 After the longest stage is the second-shortest, a 132.1 kilometre race to Donegal town. This is one of the hilliest of this year’s race in featuring six categorised climbs and it will represent a big challenge for the race leader. The first of those ascents is the category three Loughnambraddan, which comes 17.5 kilometres after the drop of the flag. A lull in climbing follows as the riders race to Glenties, Clooney, Naran and Ardara, after which they will battle up the category one Glengesh Pass (km. 60.5), the category three Altclogh (km. 72.8), Maeenavaghran (category two, km 80.6) and then the category three pairing of Cashling (km. 89.3) and Kilcar (km. 95). Another lull follows on the flatter roads through Killybegs, Bruckless and Dunkineely (km. 114.2), which is an An Post Prime. Soon afterwards the day’s final climb looms, the category three Drumbeagh (km. 124), with the summit just over eight kilometres from the stage end in Donegal town. “This is a short stage, but there is a lot of climbing in it. It also includes Glengesh, which, like Mamore Gap two days before, is a very tough climb. The big thing about it is you can see it for so long in front of you and you know that it is coming. The penultimate stage is far flatter, lacking any climbs and also lacking An Post Sprints. 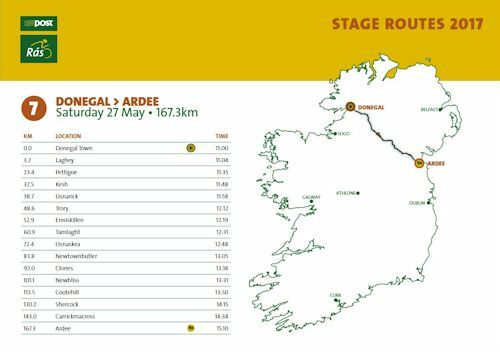 It is the fifth stage located in Donegal but heads southeast to Ardee in Louth, covering 167.3 kilometres along the way. 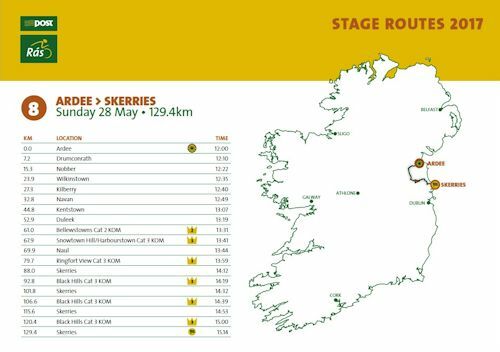 After leaving Donegal town the peloton will head through Kesh, Enniskillen, Tamlaght, Clones, Newbliss, Cootehill, Shercock and Carrickmacross before heading into Ardee and a wrangle for the stage finish. “This is another long stage. There is nothing major on it in terms of climbs, but there will be a lot of very good roads for racing on. They are very twisting and will definitely favour a break. The race ends with what is the shortest stage of the event and one which concludes along the same roads as in recent years. The first hour of racing will be flat and fast, heading for Nobber, Navan, Kentstown and Duleek before the first of six climbs. This is the category two Bellewstown (km. 37.9), and is followed by the category three Snowtown Hill/Harbourstown (km. 67.9) and Ringfort View (km. 79.7). From there the riders will race on to Skerries and the first of four crossings of the finish line. That will begin three 13.8 kilometre laps of the finishing circuit, with the category three climb of Black Hills rearing up at kilometre 92.8, 106.6 and 120.4. They will likely represent the final chances for the race contenders to wrest yellow off the shoulders of the race leader but, if the pattern of recent years continues, that will be far from certain. “It’s going to be an interesting final stage. We will be coming up the climb into Bellewstown through the racecourse. Then we will cut across towards Stamullen, then turn right for the Naul, and go up another climb there, Snowton Hill.